It’s been way too hot around here! 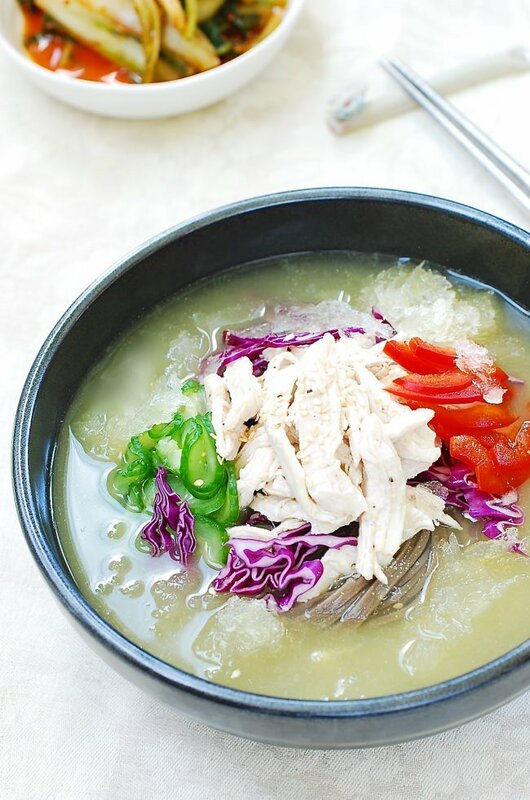 This past weekend, I made chogyetang (초계탕), which is chilled chicken soup that is tangy and refreshing and served with shredded chicken and vegetables. 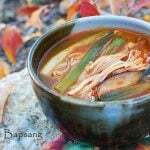 I had actually been thinking about making a hot chicken soup – either samgyetang (삼계탕, ginseng chicken soup) or dak gomtang (닭곰탕, chicken soup), ever since my son bragged about the dak gomtang he made a couple of weeks ago. But, because of the scorching heat, I went for the icy cold soup instead. 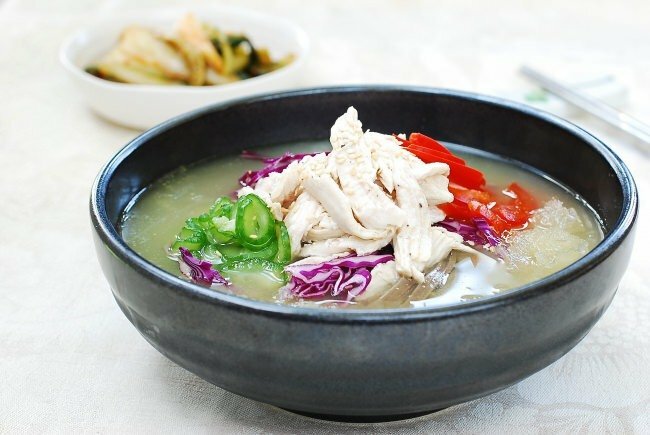 Although not as popular as boiling hot soup, especially ginseng chicken soup, chogyetang is another nourishing chicken soup that’s perfect for hot summer days! 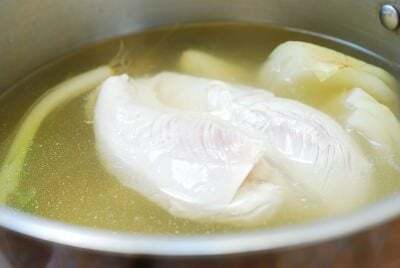 Chogyetang originates from the northern regions of Korea (now North Korea), and is often referred to as a North Korean dish. Prepared as a sophisticated dish with many delicacies, it also used to be served in the Royal Court. Cho in cho-gye-tang means vinegar, and gye comes from the word gyeja (계자), which is the northern dialect of gyeoja (겨자, hot mustard). 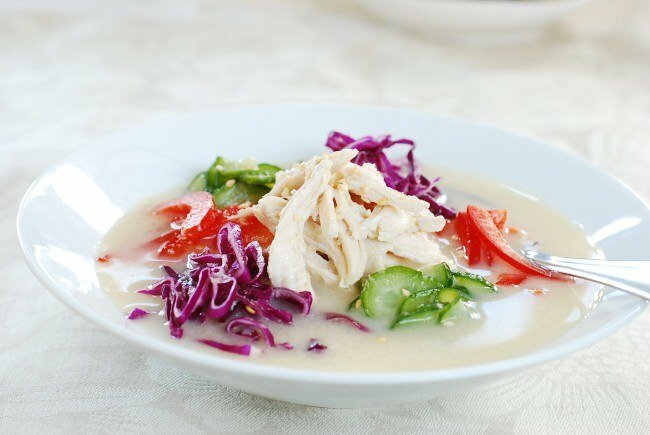 As the name suggests, this chicken soup is flavored with vinegar and hot mustard, which gives the flavorful soup plenty of tang! 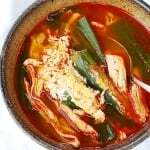 The soup starts with a base stock that’s made similar to the one that’s used to make dak gomtang or dak kalguksu (닭칼국수, chicken noodle soup), typically with a whole chicken. But, who needs to have the stove on for that long when the weather is miserably hot! 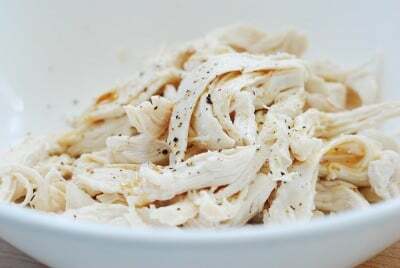 So, I decided to use a shortcut for this recipe by using a commercially made chicken stock and boneless, skinless breast. The chicken cooks in less than 10 minutes! 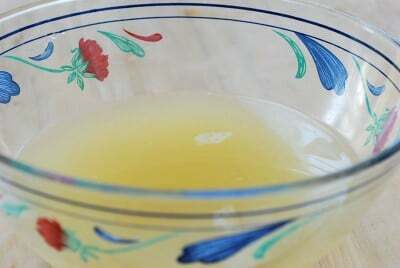 The broth is still flavorful with the help from the high quality chicken stock. The rest is easy! Season the stock, and chill it in the freezer, preferably until it becomes slushy. 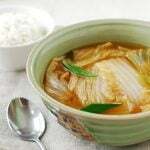 It’s common to add blended sesame seeds or nuts into the soup, adding another layer of flavor and making the broth milky, but this is optional. I only used 3 vegetables here for my simple version of chogyetang, but other options are carrot, pickled radish, sautéd shiitake mushrooms, crispy lettuce, and even Asian pear. 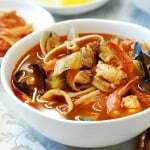 This soup is excellent on its own, but you can serve it with some noodles, making it more substantial as a main meal. 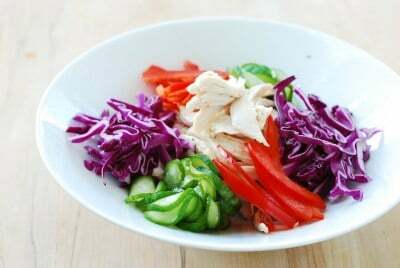 Buckwheat noodles are most common for this dish. Pour the chicken stock into a medium size pot. Add onion, scallion, garlic, and ginger. Bring it to a boil over medium high heat. Add the chicken breast, and when it comes to a boil again, reduce the heat to medium low. Cover, and continue to boil for about 8 -10 minutes. Turn the heat off and remove the chicken to a bowl. Place the pot in an ice bath to cool. Strain the stock, and discard the aromatic vegetables. The stock should be about 3-1/2 cups. Stir in all the seasoning ingredients, and keep it in the freezer to chill, preferably until it becomes slushy. 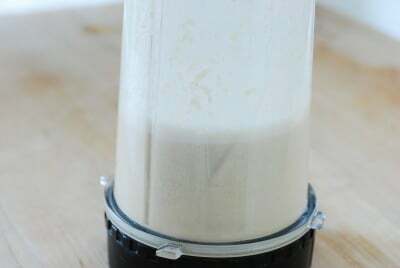 If using the sesame seeds, blend the seeds in 1 cup of the chicken stock. Add to the prepared stock before putting it in the freezer. When the chicken is cool enough to handle, shred and lightly season with salt, pepper, sesame oil, and minced garlic. Refrigerate while preparing the vegetables. 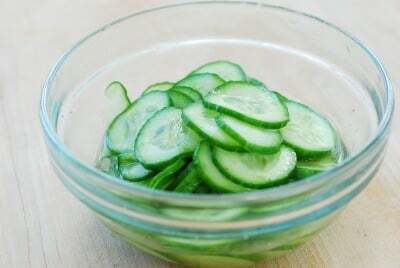 Thinly slice the cucumber, and mix well with the vinegar, sugar, and salt. Set it aside. 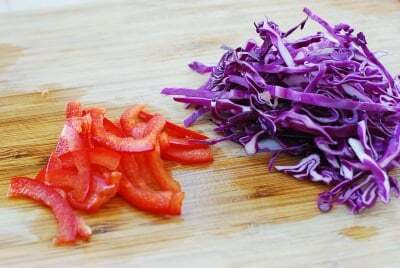 Thinly slice the red cabbage and red bell pepper. If serving with the noodles, cook the noodles according to the package instructions. Be sure to rinse them in icy cold water, and drain. 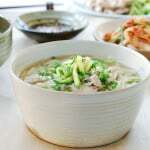 To serve, arrange the chicken, vegetables, and noodles, if using, in a serving bowl, and ladle the icy cold broth over. I really enjoy reading the details of each dish…what the words mean are especially helpful. I am hoping to have more time to cook at least one of your dishes because they sound wonderful! That’s great to hear! Thanks for trying it out!